The first round of the French elections are over, with Emmanuel Macron claiming a narrow win over right-wing Marine Le Pen. Our predictions came true and you could clearly see that the EUR/USD went in accordance with our pre-fact analysis and expectations. Investors from around the world followed the elections carefully, fearing that the wave of populism would continue following Donald Trump winning the United States' presidential elections, and the UK voting to leave the European Union in their referendum. Many worried that a victory for the anti-European candidates could further jeopardise the future of the European Union. 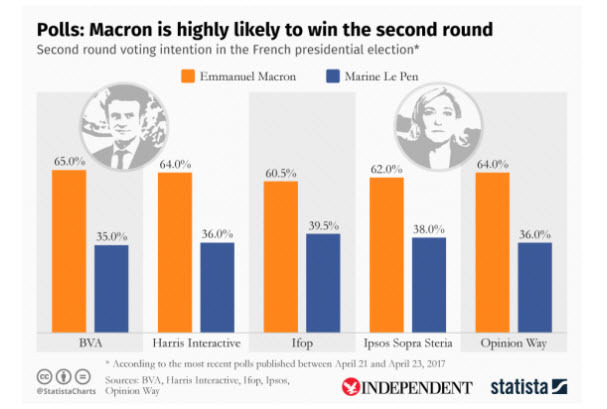 It was expected, according to different agencies, that 39-year-old Macron would beat Le Pen in the first round, and traders welcomed this news across different markets. At one point, the euro surged to 1.09 US dollars, its highest point since November, from 1.0730, as it was last seen on the New York market on Friday. At the time of the opening of the stock exchange in Asia the euro was at 1.0895 US dollars. The euro has strengthened in relation to the yen, from 116.87 to 119.40. Based on 97 per cent of votes that have been counted (at time of writing) in the first round of elections, Macron won with 23.9 per cent, while Le Pen came second with 21.4 per cent. The second round of elections will be held on 7 May. Why Is the Second Round of Presidential Elections Important? The European Union already has its hands full handling the divorce with Britain. One of the candidates that's threatening to take that same path is France. If that happens, then there following legitimate question that needs to be answered: "can the European Union survive without the two major forces, being among the most populous and richest?". I personally believe that the answer to this question is "no". 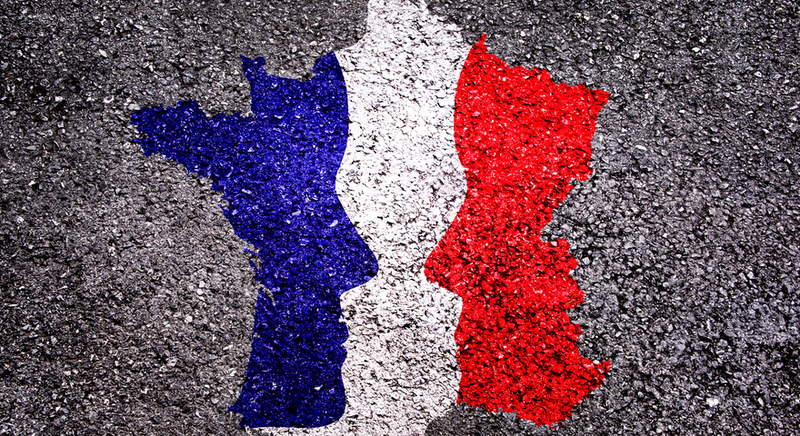 There is a growing possibility that these presidential elections in France, in addition to being the most uncertain, could bring unforeseen changes to the US too. French people have had enough of both right and left wingers and there's a huge group of people who are eligible to vote that want to "turn the tables" and start a new life. An unpredictable Europe is the last thing that a Trump-led US wants. Elections in the US and France are very similar: accusations, harsh words and corruption. All migrants from war-torn Middle East or Africa, economically damaged in the case of tectonic changes after the elections, could forget about a better life by coming to live in France. Migration, especially from Muslim countries, is perhaps the most important question of this election. It goes without saying what Le Pen's thoughts are on migration. She's an anti-immigrant by heart. The two candidates have very different economic visions. Le Pen wishes that France rejected the euro and protected French jobs. Macron is championing even tighter European integration. Markets hate instability. Good proof of this is to simply observe the market reaction following the 2012 elections in Greece. With the British saying "goodbye" to the EU, France becomes the second largest economic power in the EU. The change of this status can shake the market as strong as earthquakes. You should definitely pay attention to my pre-fact analysis and try to capture the move if you feel like trading the news. This is the screenshot of my carry over trade on the EUR/GBP where I made 135 pips on a EUR/GBP trade that goes in correlation with EUR/USD. Despite the tight margin, I believe there are very few scenarios that could put the brakes on Mr Macron's charge to the Élysée Palace. The market had already tried to price in the Le Pen victory and I was one of the rare analysts who dared to predict a certain pricing in. The aftermath was a EUR currency basket up-move. Of course, I don't have a crystal ball and, as always, ANYTHING can happen, but the only thing that I was sure of was that "if the market has already priced in a Le Pen victory in round one, then any surprise in the results might spike the EUR" as is explained in this FXstreet.com poll. According to StatistaCharts created for The Independent, Mr. Macron shows a polling level of 63.1 per cent on average in the second round, versus Ms. 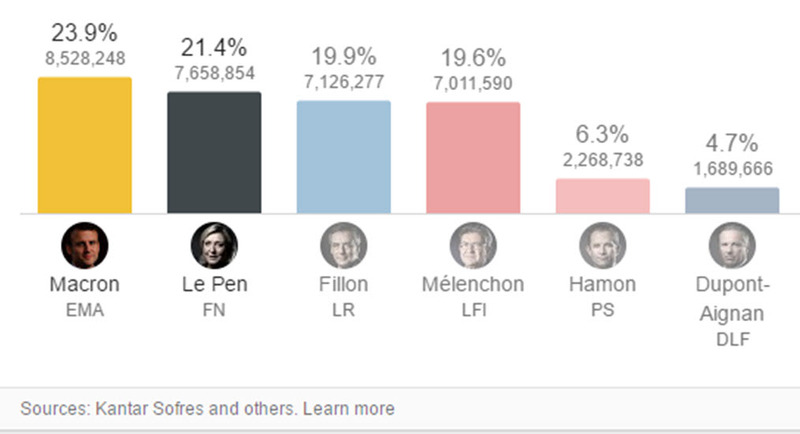 Le Pen's 36.9 per cent score. My personal opinion is that Germany and the majority of the European Union, as well as Washington, want a clear win for the pro-European candidate – Mr. Macron – in the second round of the French presidential elections. A victory for the anti-European National Front candidate, Marine Le Pen, would clearly jeopardise the survival of the EU. Macron's victory would strengthen the foundations of a Europe seriously shaken after Brexit, the migrant crisis and the election of Donald Trump as President of the United States. While Mr. Macron remains the clear favourite to triumph in the second round, the risk to that could be another terrorist attack just before the elections. Let's hope that won't happen.